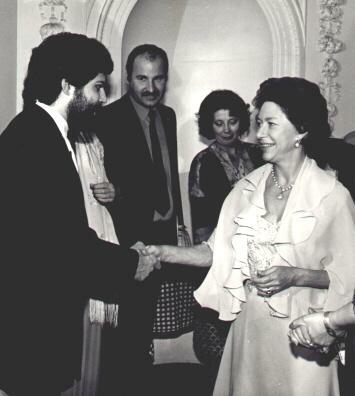 Yes John that’s Me being presented to Princess Margaret at The Silk Commission fashion show in Edinburgh; it was just before Princess Diana’s wedding in 1981 (May I think) – David and Elizabeth Emanuel were showing 3 silk taffeta wedding dresses! You may be able to detect that my eyes are vampire-like, my make-up is by Richard Sharah. Actually it wasn’t a fashion show that I particularly enjoyed, it was more like an extravagant, over ostentatious wedding where the bride’s mother was a cross between Hyacinth Bucket (Patricia Routledge in Keeping Up Appearances) and Edina Monsoon (Jennifer Saunders in Ab Fab) – but maybe that’s because I got pissed halfway through? The fashion show itself was a charity event organised, I think, by The Silk Commission (a now defunct organisation promoting silk in fashion) and held at the stunning Hopetoun House, South Queensferry, Edinburgh. Princess Margaret was in attendance, and it was she, I assume, who’d sent the lovies into a tizzy. There was more pressure however; the fashion show was held a few weeks before the royal wedding (which took place on Wed 29 July 1981), and David and Elizabeth Emanuel were there gently teasing us with three silk taffeta wedding dresses – more excitement and speculation among the pseudo-glitterati – ivory silk, pure taffeta, antique lace, thousands of pearls and sequins and a shed load of train, didn’t really pull onto the platform! The hair for the fashion show went well, it was typical 1980s big hair, glamorous, avant-garde and slightly Gothic chignons. The make-up artist was the intriguing and funny Richard Sharah; weirdly, I cut his hair in the afternoon before the show, and he did My vampire like make-up! The main event was in the evening. Vangelis’s Chariots of Fire blasted out, I stood at the entrance to the runway, checking the models before they walked out – almost everyone else tried to peek through a minuscule hole in the curtain! One canny eyed observer claimed to spot Princess Margaret refilling her glass from a gin bottle hidden in her bag! After the fashion show all of the combatants were presented to the wonderful Princess Margaret – hence the photograph – then we retreated to a Summer Ball in the main house (the fashion show was in a wing). Plenty of booze and grub. Reginald “Reggie” Bosanquet (9 August 1932 – 27 May 1984) anchor of News at Ten for ITN from 1967 to 1979. Image courtesy UPPA (Universal Pictorial Press Agency). It was the end of the evening and the taxi was late, I’d been standing outside on the drive and I’d decided to go back in. Walking up the stone steps that form a grand and impressive main entrance to Hopetoun House, I looked up and saw Reggie standing towards the top. He rocked backwards and forwards almost imperceptibly, and he fixed his eyes on me. The man was a well-known television personality and alcoholic; for years he’d been lampooned in the media with nicknames like: Reginald Beaujolais, Reginald Boozalot and Boozy Bosie. But I’d always liked his rakish look. At the time (1981) Reggie was ‏Rector of the University of Glasgow which is why, I assume, he was there. As I ascended the stone stairs Reggie, with his eyes firmly fixed on mine, fell forward. I rushed up and managed to grab him by the front of his dinner jacket, and sort of pull him to the side, which stopped us both falling down to a gay looking death! I just left him laying on the step and went back in. This entry was posted in #HairHour, 1980s, Fashion Show and tagged Hopetoun House, Princess Margaret, Richard Sharah, South Queensferry by ian. Bookmark the permalink.